In addition to general PHP profiler that allows you to analyze the code performance in order to find bottlenecks in the code, PhpED also provides PHP SQL profiler to trace SQL queries made in PHP code, the number of times they are called and the break down of their open, execution, prepare and fetch results times. The following databases are supported: MySQL, MySQLi, PostgreSQL, Oracle, MSSQL, and all databases accessible with PDO classes. Open a project containing php scripts you want to analyze. Open the starting file of the project in the editor. To run the profiling process press Run Profiler button on the debug toolbar or select Run > Run profiler or press Alt+F9. Profiler window will appear automatically on competing the profiling session. 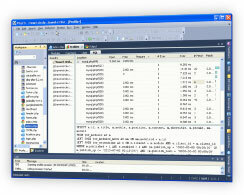 Analyze the code profiling results in the profiler window. Location. Shows the code lines where SQL query is executed. Chart. Shows the relative value of every SQL. The highest value is assigned with 100%, while the others are shown as against to this one. In the popup menu you can select any output column to be displayed in the chart. First time use [Run Profiler] button on the debug toolbar or select Run > Run profiler or press Alt+F9. You can bring up the profiler window again. Select Tools > Show profiler.